Our mattresses are made in North Carolina, USA. What size mattresses do you offer and what are their dimensions? What materials are your mattresses made from? Our mattresses are made from ultra-premium high-density foams that are above industry norms for density. Do your mattresses contain any flame retardants? Our mattresses do not contain flame retardants. Do our mattresses smell or outgas? All of our foams are CertiPUR-US (www.certipur.us) and you can find more specific details on their website. In addition to being CertiPUR-US, we assemble and cure our mattress for 24-48 hours before assembly and shipping. This curing period allows the foams to breathe and set before final assembly. Our mattresses are sealed airtight and wrapped in heavy plastic which can cause a residual odor. This is a fairly common occurrence in all foam compressed beds. Any smell will dissipate within 7-10 days after opening. That being said, you may notice an initial "new" smell out of the box. Great news! Shipping is free for residents in the contiguous U.S! Some handling fees will apply for residents of Alaska and Hawaii. Do you ship your mattresses to Canada or internationally? We do not ship our mattresses to Canada or internationally at this time. How do you ship your mattresses? What is the turnaround time to process and ship my order? Our orders will be processed in 2 business days. How big is the box that the mattresses are shipped in? Is there a trial period for your mattress? The minimum trial period is 45 days before you can process a return and the maximum trial period is 100 days before you can return or exchange. What is the return/exchange policy on your mattress? We offer a hassle-free Money Back Guarantee. When your NuSeason mattress arrives you have a risk-free 100 nights to sleep on it. If you decide your NuSeason mattress isn’t right for you, email support@gelpro.com or call toll free 1-877-435-2433 and we will send you a return email with instructions on how to remove the product from your home and donate it to a local charity. Once your mattress is donated, send us a scanned or photograph copy of your donation receipt via e-mail and we’ll process your refund in full. It really is that simple. You can contact our customer experience team 24/7 via e-mail: support@gelpro.com or by phone: 877-435-2433 Mon. thru Fri. 8 am to 5 pm CST. What is the warranty on your mattress? The warranty on our mattresses is 10 years. The warranty includes the mattress only and not the outer cover. Will I need a box spring or platform? The mattress can be placed directly on a floor or on a proper foundation or platform bed. For King and Queens placed on a foundation or bed frame we recommend center support. Can the NuSeason Mattress be used with an adjustable base? 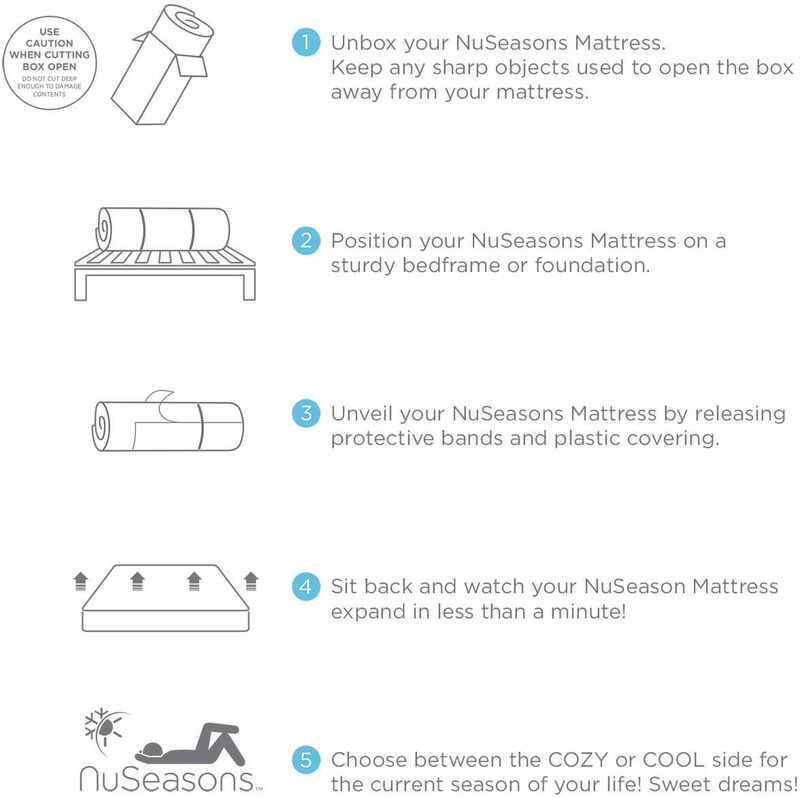 Yes, the Nuseasons Mattress works well on an adjustable base. For a King size adjustable base, you can order two Twin XL mattresses for your King platform so each one works independently. There are no weight restrictions or limits. How do I store the mattress? A mattress should be stored flat in a dry environment or a climate controlled storage space. Mattress storage bags and/or boxes can be found at most U-Haul locations or online.